To the average gym-goer, kettlebells are often shrouded in mystique and confusion. And to be fair, they look like cannonballs. But with handles. They're also usually in kilograms - and not to sound too much like Ricky Bobby - but this is America. So I shouldn't be surprised that a few weeks ago I met a fellow fitness professional who asked if I "do" kettlebells. Now, they could've simply misspoken. My inner grammar nerd can rear its ugly head, even as I struggle to end my own love affair with adverbs, commas, and bland verbs. I would've preferred "use," "lift," "work with," etc. But based on the context of the conversation, it didn't appear this was just a matter of word choice. Instead, they seemed to think that training with kettlebells used an entirely different skill set than what they did for training. And to be clear, there are a few unique considerations for training with kettlebells. If you take a wide view, however, training with kettlebells can also be called: "good training." The main movements with a kettlebell - squat, swing, and deadlift - promote the same patterns and movements as dumbbells, barbells, and natural human movement. And if someone has been coached well, they should be able to move almost seamlessly from kettlebells to barbells or dumbbells - and vice versa. The offset center of gravity is the first consideration that must be given to a kettlebell as it can bug someone's forearm if they hold it incorrectly. I often joke that a simple adjustment to one's grip or wrist position fixes the issue 95% of the time, every time. Still, if someone lacks the requisite core or shoulder stability, or overhead mobility, their problem with holding a kettlebell is just a sign of something larger. The Turkish get-up is usually the next consideration that many people associate with kettlebells. Is it a unique and complicated move? Yes. But is it unique to kettlebells? No. It's only associated with kettlebells due to the popularity of this move from Pavel Tsatsouline, who brought it to America when he introduced kettlebells. The good news? You can use whatever tools are available in your gym to do get-ups. Dumbbells, barbells, sandbags, a half-filled cup of water (or half empty, depending on your life outlook), you name it. Just remember to keep honing the basics and to ignore the puzzled onlookers. And finally, kettlebell swings are unique to kettlebells because after all, it's in the name! But if you look at a properly executed swing in slow motion, does it look all that different from a vertical jump? I don't think so. But is it safer than actually having people jump? You best believe! Below are images of a kettlebell swing and a vertical jump. And besides Pavel on the left looking like all-that-is-man, they really don't look all the different. It's easy to see why swings have been labeled "a fat burning athlete builder," and why there's both anecdotal and scientific evidence of how swings have improved many individuals' ability to jump and lift. Attire and arm position notwithstanding, these two look pretty similar. And in case you're wondering how much work your arms should be doing during a kettlebell swing? Not much. The arms are guiding the bell, just as your arms are guiding your momentum during a jump. Next, here are two images of a deadlift - one with a kettlebell and one with a barbell. Once again, do they look all that different? The deadlift: the most natural - and important - human movement. I'll go a step further and say that the kettlebell deadlift is the best progression for leading to barbell deadlifts. Why? Because the sumo variation pictured above is the easiest way for people to learn how to deadlift (something I wrote about here). The kettlebell's center of gravity also reinforces the hinge pattern in a much more user-friendly way. You just need kettlebells that are heavy enough - usually 50-70 lbs and up. Are these all that different? And yes, a properly executed squat WILL most likely bring your knees past your toes. If you look past the arm position in the two photos, you'll see an almost identical movement. The argument could also be made that heavy goblet squats with a kettlebell (pictured above), are all the majority of people need. It promotes of mobility and core stiffness, while offering a better risk/reward. But once again, you just need heavy enough bells. Many people want to know whether kettlebells versus dumbbells or barbells are superior for training. It's the wrong question. 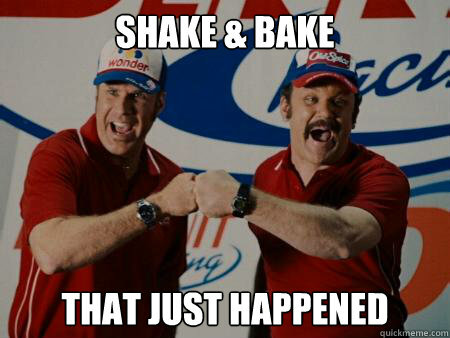 As Ricky Bobby would say, they go to together like "shake and bake."